Wow – Atlantic Cities let someone with no clue about development in Brooklyn write about development in Brooklyn. The basic premise of the article is that zoning (both use and FAR limits) is making housing more expensive by restricting the amount of new housing that can be constructed. In other words, the classic libertarian argument about land-use restrictions. According to data from the U.S. Census Bureau, the number of housing units in the five boroughs inched up an average of 0.5 percent annually between 2000 and 2010. That’s not even enough to keep pace with average U.S. population growth, which is about 1 percent per year. The 2010 Census is so flawed, particularly with regard to Williamsburg and Greenpoint, that no credible argument can be based on its data. Remember, according to the census, much of North Brooklyn did not see a population increase between 2000 and 2010. Despite the very gentrification that Smith writes about, despite a building boom that has added thousands of new housing units since 2002 and despite a massive rezoning halfway through the decade that allowed for the creation of thousands more new housing units in formerly industrially-zoned areas. In all, something on the order of 4,000 new dwelling units (very conservatively estimated) have been added to the western parts of Greenpoint and Williamsburg since 2005 (the areas within and immediately adjacent to the 2005 rezoning). Hundreds if not thousands more have been added elsewhere in Greenpoint, Bushwick and the Southside. What industrial zoning along the waterfront? 80% of the Williamsburg/Greenpoint waterfront was rezoned for residential use 7 years ago, and another 10% (Domino) in 2010. Hundreds of new housing units have been created on the Williamsburg waterfront, and hundreds more are coming to Greenpoint. There are three blocks of the Williamsburg waterfront that are still zoned manufacturing (between Grand and North 3rd) one of those blocks contains a power plant), and the other two. Meanwhile, the remaining industrially-zoned areas of north Brooklyn are creating a lot of jobs. Good jobs, too. Look at the Brooklyn Navy Yard, a center of high-tech manufacturing and film production. Look at GMDC, which has a waiting list of small manufacturers. Look at the booming film production industry in Greenpoint. Historically, many people in north Brooklyn worked in north Brooklyn – not in Manhattan. Bushwick Creek is not in East Williamsburg. It is not even a creek anymore. It is an inlet on the East River that divides Williamsburg and Greenpoint. Yes, the city created a small industrial carve out around Bushwick Inlet in 2005, and no, that carve out probably doesn’t make any sense. …northern Brooklyn is underdeveloped. The hip neighborhoods around the L train, the main vehicle of gentrification in Williamsburg and Bushwick, are less than half as dense as Brooklyn neighborhoods like Crown Heights and Bed-Stuy. Perhaps true – hard to tell from a jpeg of a map with no data sources listed (perhaps its from the census?). Regardless, much of Williamsburg and Greenpoint is actually under built compared to the allowable zoning. The potential density for north Brooklyn at current FAR limits is well above the actual density (in fact, it is probably comparable to the density shown in the fuzzy jpeg map, which seems to show much of brownstone Brooklyn at higher density than north Brooklyn – though all these areas have roughly the same zoned density). Aesthetically, the vinyl-covered two- to four-story houses that dominate are some of the ugliest in the city. They lack the ornate cornices of their peers in south Brooklyn, and the brick patterns hidden behind the vinyl and stucco are plain compared to other pre-war styles. Problem is, from an infrastructure point of view, north Brooklyn is hurting. 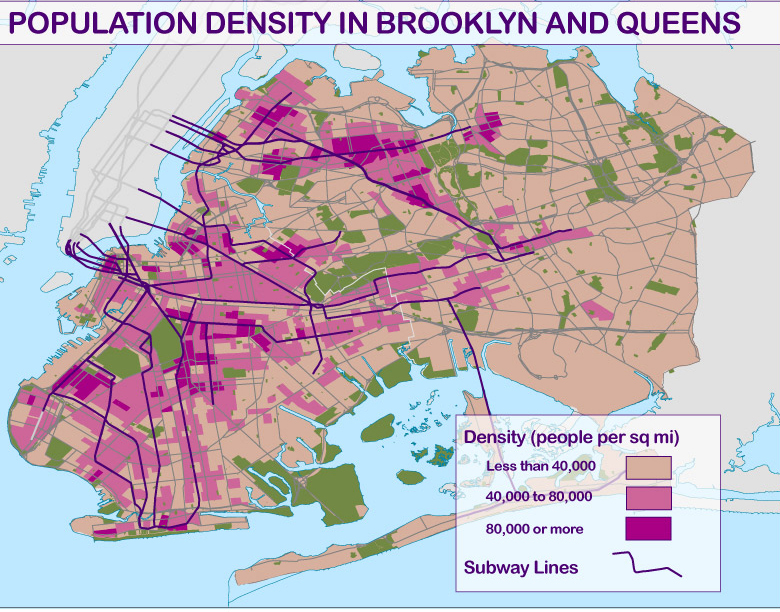 Unlike other areas of Brooklyn with higher population densities, north Brooklyn is not as richly served by public transit (if you pay attention to the map, the areas of highest density are along the public transit corridors), and it does not have as much park and open space as a lot of other areas. L trains run at capacity (in part because more newer residents are more likely to work in Manhattan, not locally), JMZ trains are rapidly gaining capacity (and neither line can be readily expanded), new bus lines, bike lanes and ferries are being added (but that only helps at the margins), parks and open space are overcrowded and over-utilized, and on and on. Sure, we could double the zoning density of North Brooklyn, but our infrastructure can’t even handle the thousands of people who have been added to the area to date, let alone the thousands more that will be added if currently as of right development continues apace. Hi. I’m the author of the original article. Maybe I’ll get to the rest later, especially the points about zoning, but for now I’d like to address your first and last points about the census and infrastructure. Yes, the census was flawed. The city probably added twice the population in 2000-2010 as was officially recorded. Massive undercounting in Williamsburg, as you wrote, as well as the immigrant-heavy parts of Queens (as I recall some of the numbers coming out of Flushing were absolutely unreal). However the problems with it were with population figures, not housing unit data. It’s easy to miscount people; a lot harder to miscount housing units. As for infrastructure, contrary to popular belief, the L is actually nowhere near capacity. Yes, the trains are crowded, but new trains would be relatively easy to add. Much easier than the 2nd Ave. subway, the 7 train extension, etc. It would take some will on the part of the MTA, but based on my understanding of housing and subway politics, the political hurdles to adding service (namely, labor reform) are substantially lower than the hurdles to increasing allowable density in the area. With the recent CBTC/ATO upgrades, the L train can supposedly do 30 trains per hour per direction, or 2-minute headways. (Although really the industry standard these days is 90-second headways, or even less, so there’s probably room for improvement if further signaling upgrades are made.) My understanding is that it’s currently doing 20 tphpd during rush hour, or 3-minute headways. This means that they could ramp up service by 50% without even upgrading the signaling. You’d need to buy more trains (at least for peak service – off-peak, they’ve got plenty lying around), but labor costs should come down when (or, if you’re a pessimist, “if”) management wins OPTO (one-person train operation; i.e., getting rid of the conductor and having the operator open and close the doors, as is the case in every subway system in the world aside from some retrograde North American lines and legacy Tokyo lines whose crowding makes the 4/5/6 at rush hour look roomy) from the union, which as I understand they’re trying to do in the current contract negotiations (though the fact that Lhota left in the middle isn’t a good sign). The L actually had OPTO for a brief period back in 2005 (or around then? ), so I would be very surprised if management doesn’t come out victorious on this front. As for the G and the J/M/Z, both have lots of spare capacity (in fact, I think the J/Z has the most slack of any line in the system, minus the shuttles), though as with the L, they’d need to buy more rolling stock and bring down labor costs. Much as I would have liked to include a sentence or two in the original piece on the L train’s extra capacity, I was bumping up against the word limit as-is. Anyway, thanks for the response…glad you read it, even if you disagreed with a lot of it. Hopefully I’ll have time to respond to the rest of your post later. Thanks for the reply – I look forward to hearing more! Regarding the census, I think part of the problem in north Brooklyn (at least) was that the census didn’t know where the housing units were! A lot of housing that didn’t exist 10 years before was coming on line in the year or two before the census. Add in loft conversions and other ersatz housing, and housing units, and there was a lot of housing units for them to miss. As for the L, yes, OPTO would increase the headway from 3 minutes down to 2. But the L train would probably be OK if it could just keep the 3 minute headways. In addition to frequency of service, the big problem with expanding capacity on the L is that it is restricted being a one-track line. OPTO or no, if one train gets delayed – sick passenger, the dreaded earlier police incident, whatever – the whole line backs up and the platforms quickly fill up. (And off-peak isn’t much better – ridership on the weekends is 90% of what it is on weekdays!). The JMZ does have the advantage of having an express track, so trains can bypass problems. Can’t do that on the L.
I don’t know if the JMZ has the most slack in the system, but it certainly has room for growth. That said, it is one of the faster growing lines in the city. Regarding the census – my understanding is that the city is only disputing the population figures, not the total housing units figure. I’m not sure, but I suspect that building permit data was used in some way. I’m sticking to my guns – the census’s housing data is solid. As for the L only having one track in each direction – New Yorkers really overestimate the difficulties of only having two tracks. New York actually has the only subway system in the world that is predominantly quad-tracked, I believe. London, Paris, Tokyo, Osaka – all manage to have subways that run at higher capacities than the L, despite not having express tracks. The crowding that the L currently experiences during the morning rush is not the fault of occasional delays, it’s the result of not running enough trains even on an on-time schedule. As for the nighttime, this problem is easily solved: run more trains! In fact, more demand off-peak is actually a good “problem” for transit companies, since they can ramp up service off-peak at a relatively low marginal cost. (Contrast this to rush hour, where you need to buy more trains, make signaling upgrades, maybe even dig new tunnels, etc.) There are no track or rolling stock capacity bottlenecks at night, since service is nowhere near rush hour levels. Once OPTO is instituted, then the MTA will be able to double weekend and nighttime capacity – hell, even middle-of-the-day capacity – for nothing more than the cost of extra electricity and a little bit more wear-and-tear on the plant and infrastructure. Regarding “Bushwick Creek,” this was my mistake – I meant Newtown Creek, not Bushwick Inlet. I’ll ask for this to be corrected. And by “waterfront,” I meant the creek’s waterfront, not the riverfront. This land was originally home to manufacturing because of its access to rail and water on which to ship freight, but now that both of these have been superseded by trucking (at least in big cities – freight rail is still viable in a lot of the country, just not here), the area is industrially zoned simply because it’s always been that way – no other good reason. There’s not even much manufacturing left – it’s mostly bulk retailing, warehousing, auto repair, etc…stuff that doesn’t involve mass transit, to which the area has good access. Glad we both agree that this kind of misinformation has to be countered whenever possible.